You stopped putting entries in your training log in May. The soundtrack to your training could have been ‘I can’t stand up for falling down’. You end up using a crutch because you got a bone fide shin splint, and a seriously bad one at that. You discover, rather late, in December that the orthotics that you have had for nine years and which clocked up about 12k miles are done and have been causing a few bio-mechanical problems. You finish a race knowing the sweeper’s life story. If I thought 2016 was mediocre, 2017 has plumbed new depths, or has it? How do we define success, failure, mediocrity? How often are we our own worst critics, or fail to manage our own expectations? 2017 started well, very well. A trip to the Namibian Desert, a tough marathon in 36 degrees and a week later a marathon in Mongolia in minus 32; the only person to complete the double and with a 34 degree temperature shift. Rather oddly both marathons done in the same time bar a few seconds. I am consistent if nothing else. Not only a great running achievement but a fantastic cultural experience. Getting a bit carried away and doing a 20 mile glee club training run a week after that was perhaps not the best of plans. It wiped me out and I had to take some rest which then set my training back. That was to be the theme for the rest of the year, chasing my fitness and never being quite ready for the race. Point in case the Kielder 80k and the North Tyne Trail. Last place in the first and pretty close to the lantern rouge in the other, but I did get first old fart at Kielder. The Selkirk Ultra became the Selkirk half as I bombed out. A couple of bad tumbles in the late spring and early summer set me back again. Stomach issues at the Great Glen (July) resulted in a DNF at twenty miles. Why am I doing this? I made it to the Devil of the Highlands start line (August) with absolutely no expectations. I was on plan ‘Z’: just finish and try to enjoy it. I did both, but it was not exactly a stellar performance and there was a sting in the devil’s tail. A poor shoe choice along with the ‘time on feet’ resulted in the aforementioned shin splint: ouch, ouch, ouch. 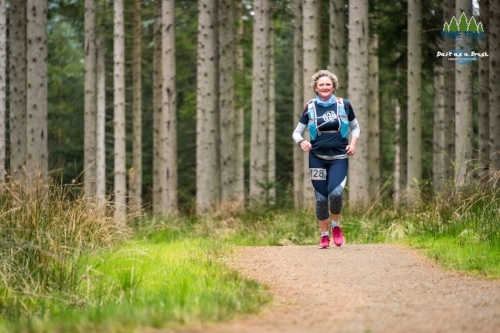 Four weeks of no training – ooft - and things were not looking good for Dunoon 55k and the Raid Des Bogomiles in October. Twenty miles of pain free sweeping duty at the Ochil Ultra (end September) gave me a fighting a chance. I completed the Dunoon 55k: phew! If the races in January were my ‘A’ event then the Raid Des Bogomiles was my ‘B’ event and the European leg of the revised Global Odyssey (long story for another day). I was going, but would I be able to finish and would I make the cut offs? It was 103k and 4,300m (14.5k feet) of climb. It didn’t look good as I slogged along in last place, chased down by the sweepers and making the first cut-off with only minutes to spare. I remained in last place to half way but managed to put an hour in the bank. Overnight I got the jump on a few runners and passed a few, finishing in under twenty four hours: astonishing. I had said to Alasdair I might be timed out and would probably be close to the allowed twenty seven hours which I would be happy with. I would be really happy with anything close to twenty four: so I was ecstatic. Quite why I entered or turned up for the Tweed Valley 65k ultra I am not sure. It was too soon after Carcassonne; but I persisted, and I finished last. Talking of persistent; old niggles rose phoenix like and should have triggered alarm bells, but I put it down to the falls and lack of training. No, it was indeed the old bio-mechanical issue. My trusty orthotics having finally had enough abuse gave up the ghost. December has been, frankly, a write off for training, but I have enjoyed what training I have managed to squeeze in. There have been quite a few disappointments over the year. The cherry on the top of the disappointment icing was being told I could not have leave from work to return to Mongolia to run 100 miles on the blue ice of lake Khovsgul. It is all part of being a runner. We fall, we get injured, we under train, (we over train), life and work interfere with our plans, the day does not go as expected or hoped, we get tired, we need recovery. We cannot be at our peak all of the time. Part of being a committed runner is take the lows as well as the highs, writing it down to experience and just getting on with it. As we approach a new year it is time to put the old year behind us and put plans in place for new challenges and to motivate us through 2018. My year was not so bad. It just felt bad. I have been luckier than some and I have completed a decent number of tough events and recovered from falls and injuries, and I am armed with a new pair of fabulous orthotics. Lessons learned, I look towards 2018 with optimism and excitement for new adventures and challenges, not to mention the next stages of the Global Odyssey 100.